How to use LeadGrabber MF Pro? I need technical notes / developer notes to be shared with my IT team before installing eGrabber software. You can find the notes here https://www.egrabber.com/blog/it-documentation-for-egrabber-product-installations/ any further questions contact us at support@egrabber.com and we would be happy to help. 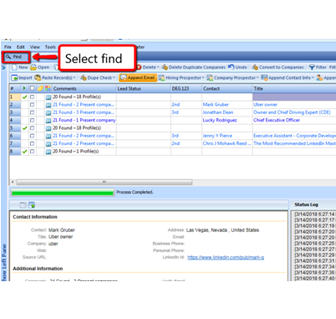 What’s the difference between LI Management-Finder and C-Level Management Finder? Either Sales Navigator or Recruiter. No. Does not require any LinkedIn subscription. However, if you do have a LinkedIn subscription, you may get much better results. Example: If you ask for CEO, and a company does not have CEO, it will search for Owner and Founder. LI Management-Finder relies heavily on LinkedIn to do the matching. Example: If you ask for CEO, and a company has a "Chief of Staff to CEO", this record matches and will be captured. C-Level Management-Finder relies heavily on its own intelligent algorithms and heuristics to do the matching. Example: If you ask for CEO, and a company has a "Chief of Staff to CEO", this record will NOT be captured. I need more than 7,000 names from LeadGrabber MF Pro. What should I do? You can add 1,000 more for $495. You can also buy in multiples of 1,000. Call us on +1-866-299-7314, we’ll help you get this. Refer to this link for more info. How does the count / billing work in LeadGrabber MF Pro? If you buy the $3,495 pack of LeadGrabber MF Pro, you get to append 4,000 executives. And to get this list of executives the product will scan up to 12,000 companies. 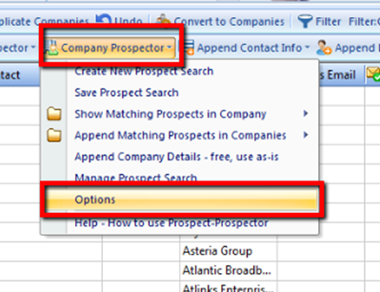 LeadGrabber MF Pro utilities one Executive Count for every person’s name it finds and adds to the grid. And it utilizes one Company Count for every input company. You need to get a re-fill when either the executive count reaches 0, OR the company count reaches 0. So please be careful NOT to avoid companies and businesses that have a very low chance of having executives on the Internet. For instance, bakeries, barber shops and pizza outlets don't have company websites, and neither are their owners on LinkedIn®. You can track both these counts in the product. Click the "Add-ons Check Meter" in the product menu. The window that pops up has these two counts in it. We recommend you test out a small sample list with Management-Finder. And if you find that the company count is reducing quickly, without giving you any executive names, you should consider trashing that company list. Or, at least don't use Management-Finder on it. How many Names/ Prospects can I capture in one day? It’s hard to estimate, because this depends on what companies that you put in, and on how extensive your LinkedIn network is. The product restricts usage to 500 profile/search downloads a day. This is for your account safety. For each company search, the product uses at least 2 of these downloads, irrespective of whether it finds matching prospects or not. The number of matching profiles count for 1 download each. We suggest you try LeadGrabber MF Pro for a list of your target companies and estimate your daily throughput yourself. I want to increase / decrease the number of prospects that are being captured to the grid. How do I do that? If you are using the LI Management-Finder, you can read about that here. If you are using the C-Level Management-Finder, you can read about that here. I notice that there are matching records deep in my LinkedIn® search (somewhere on page #2) but LI Management-Finder is stopping short of finding it. What can be done? 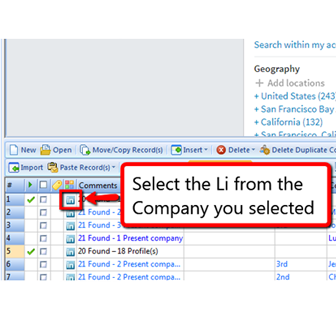 LI Management-Finder does not scan all the records returned by the search. It scans up to 3x times the number of records you asked it to capture. So if you ask it to capture 5 records, it scans up to 15 records. This limit on scans has been put for safety of your account. I am using the LI Management-Finder, the records that got captured are not what I intended. If I need to inspect the search which was done for a company, how do I do that? If you think the records which were captured are not what you intended, then chances are, you need to change the search template that you provided LI Management-Finder. You will find the search list in the browser. I am using the LI Management-Finder, have setup my search template asking for Current Title = CEO. Why am I getting “Chief of Staff to CEO” captured? LI Management-Finder relies on LinkedIn to serve relevant and matching records. 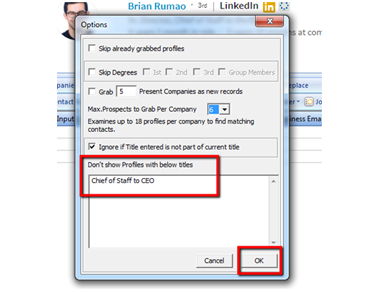 When you ask for Title = CEO, LinkedIn may serve “Chief of Staff to CEO”, or “Executive Assistant to CEO”, or “Deputy CEO”. Notice that LinkedIn® is giving you records with a partial match. If this is not the results that you expect, then you can make use of the Ignore Setting. Type the titles you want to ignore. I am using the LI Management-Finder, have setup my search template asking for Seniority = “C-Level”. Why am I getting non-C-Level profiles captured? LI Management-Finder relies on LinkedIn to serve relevant and matching records. When you ask for Seniority = C-Level, LinkedIn may serve non-C-Level people as well. LI Management-Finder does not heavily filter such records. You need to edit your search template so that such records are not served by LinkedIn®. However, beware of making your search criteria too tight - you may lose the records you intend to find. From a search strategy point of view, it is better to have a loose criteria which gets a handful of non-matching records, than have a tight criteria which ignores your target records. Are eGrabber tools GDPR compliant? GDPR focuses on how businesses should treat personal data of EU citizens. eGrabber products are designed for the US market & compliant with all US laws. Our products can however be used by users in any part of the world. eGrabber does not give legal advice on compliance with any laws around the world – however here is the data points you can consider to determine if our solution is appropriate for your needs. eGrabber tools do a fast-copy-and-paste of contact data, and also perform fast Internet research on publicly available web pages and documents. We use several 3rd party vendors for accessing data and verifying data & email addresses. eGrabber has no control over where our users get the data from, or what our users do with the data that our tools find. eGrabber tools run on individual user's desktops and not in the cloud. All contact data is stored on the user's local PC. Here are some useful blog posts that may help you with your understanding. We have no affiliation with any of these companies. My company requires our paper work to be signed by vendor before we purchase. Or Can I send our company vendor contract for you to sign? Our software is a standard package we have been offering for 10+ years. We have been in business for 20+ years. To keep our Price competitive, For standard license purchases we provide the following license agreement and this FAQ. We can provide additional info if required, for deal sizes closer to $100K. The deal has to cover the costs of legal review by our attorneys. The information on our products and our company can be researched on the web and through our FAQ. How is LeadGrabber able to provide the Best Quality at the Lowest Price? Our technology architecture results in lower operating costs. LeadGrabber Pro runs on your PC, and NOT on our servers. We don’t have to undergo maintaining a huge web-server infrastructure, like other competitors, to support you. Our solution uses your PC and your internet resources to do the research – saving us costs that we pass on to you. We have lower R&D overhead, resulting in cost savings to customers. By having a large part of R&D done offshore, our costs are small fraction of what other companies incur. Our high ROI Sales tools have enabled 100,000+ US Companies over the past 20+ years to be more productive. We have already amortized our cost of R&D over many years. We have lower marketing costs, resulting in lower cost overhead. We don’t tend to have priced marketing executives flying to expensive tradeshows to seek visibility. We don’t have to recover those expenses by charging our customers. This strategy has enabled us to deliver lower priced high quality solutions, helping us organically to accumulate 100K+ companies as paid customers. We have lower sales costs, resulting in lower prices. We don’t seek Enterprise Customers; Our typical customer has a 1 to 5 man team; is an entrepreneur, owner or department manager who is very ROI focused in cash allocation. They can determine within hours our products are accurate, provide great ROI, within their budget – resulting in pretty short purchase cycle. They see we provide solid features, without all the marketing fluff that doesn’t help them sell more.